If the name Mario Fortino Alfonso Moreno Reyes doesn't ring a bell perhaps Cantinflas does? The Mexican comic film actor, producer and screenwriter was best known for his portrayal of Cantinflas part campesino (peasant), with a quick tongue that poked fun at the pretentious and powerful and a wicked sense of comedic timing. Dubbed as the "Charlie Chaplin of Mexico", his claim to fame in the US Market came when he co-starred with David Niven in the 1956 film Around the World in 80 Days which garnered him a Golden Globe. While the role of Cantinflas became intrinsically enmeshed with his own identity, Mario Moreno was also a business leader who became involved in Mexico's labor politics, and was known for his work in the early struggle against the one-party government's practice of controlling unions. He was also a philantropist who was said to have donated half of his earnings to charity. 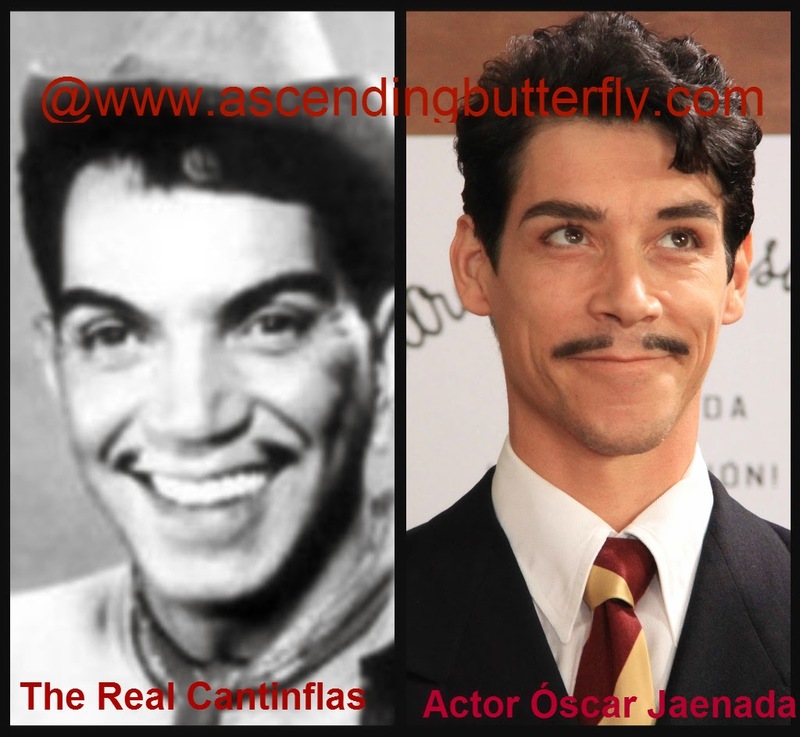 First and foremost I have to share that Óscar Jaenada does an amazing and incredibly respectful job in his portrayal of both Cantinflas the character and Mario the man. Despite how inseparable they may have been to others, there are so many nuances to playing someone so dynamic and Óscar really does do an amazing job. As you can see from the collage above, he truly nails the look! 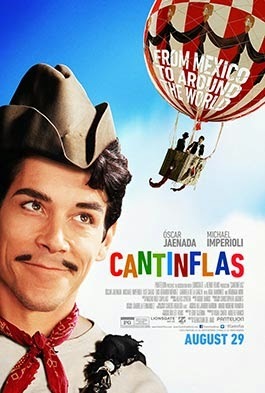 And when you see the movie it's a pleasant surprise just how well he nails the man and the character that is Cantinflas. Cantinflas is the untold story of Mexico's greatest and most beloved comedy film star of all time. From his humble origins on the small stage to the bright light of Hollywood. Mexican icon, Mario Moreno, "Cantinflas" as seen through producer Michael Todd's (played by Michael Imperioli) eyes, getting a glimpse of their collaboration on the 1957 film, "Around the World in 80 Days", winning 5 Oscars and 2 Golden Globes, and turning into the top grossing film of their time. Cantinflas tells the story of a man who got his start in Mexico's equivalent of the Vaudeville theater, his talent and humor traveling the world over. En Español: La vida de Mario Moreno "Cantinflas" se presenta bajo la mirada del productor Michael Todd con quién colabora en el filme "La vuelta al mundo en 80 días" en 1957 ganando el Globo de Oro y el Oscar respectivamente, además de covertirla en la pelicula mas taquillera de su época. CANTINFLAS cuenta la historia de un mexicano que comenzando su carrrera en una pequeña carpa arrabal, logra llevar su talento cultura y sentido del humor al mundo entero. The movie represents the timeless struggle for authenticity and success which makes it relatable to today's audience who may not necessarily understand the character of Cantinflas or his body of work. As a Latina I personally want to see this film succeed. I want our Latino Youth to see more than Hollywood's typical Drug Dealer offering, I want our Youth to know that you can be authentic and pursue your dreams. I want young Latinos to be able to see a face they relate to on the big screen. One that is taking those ganas, and doing something positive to better both himself and society at large. Get social with Cantinflas on both Facebook and Twitter, and be sure to use the hashtag #Cantinflas so we can all follow in the conversation. If you are looking for a way to beat the heat this last weekend of summer and take in a movie, you know which one I am recommending! Butterflies once you have seen the movie, come back here and let us know what you think of it. Happy Labor Day Weekend to all! FTC Disclosure: This is NOT a sponsored post, no monetary compensation has been received. Screening Passes were provided to Ascending Butterfly for Editorial Consideration. As always, all opinions are my own. I am disclosing this in accordance with the Federal Trade Commission 16 CFR, Part 255 - Guides Concerning the use of endorsements and testimonials in advertising, you may check our Giveaway and Disclosure Page for additional information regarding Ascending Butterfly Disclosure. Kudos to Óscar Jaenada he really did justice to Mario Moreno the actor and Cantinflas his comedic alter ego ! He played Cantinflas with lots of respect and did not make a bafoon of him. I loved the fact that Mr.Moreno loved his country and his people, that he helped so many and for the most part his charity work was not widely know. As a Latina I would haved loved him falling in love with a Latina but the heart wants what it wants ! In the end what counts was that he didn't forget is people !!! I hope the movie does well Or as he would say" Ahi esta el detalle !!!!!!! I'm the same way when it comes to some plot lines in movies- it's like WHY DIDN'T YOU JUST PICK xyz!!! OH, I haven't heard of this one! Thanks for sharing, will check it out! I haven't heard of the Cantinflas movie. I will have to check it out. Thanks for sharing. Haven't heard of this movie until now. Looks like something I want to see though with the hubby. I keep seeing a billboard for this movie in my city. I should see it - it sounds fun!